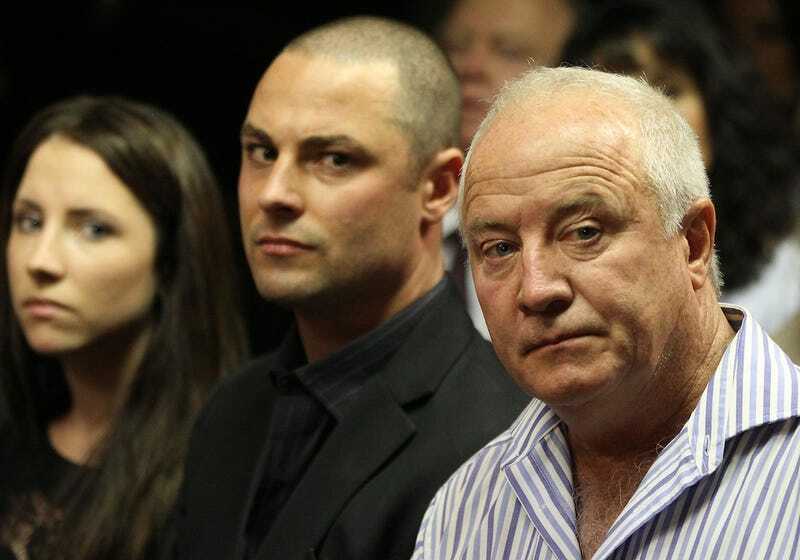 Oscar Pistorius's Brother Facing Charges Of "Culpable Homicide"
Oscar Pistorius's brother, Carl, was charged with culpable homicide in 2010 (or 2008, according to the AP) stemming from a car accident south of Johannesburg, in Vanderbijlpark. The charge was initially dropped and then recently reinstated. The news comes just days after it was uncovered that lead investigator Hilton Botha had seven charges of attempted murder dropped and recently reinstated. "It's related to an accident that happened in 2010, in which he had a collision with a female motorcyclist," e-News Channel Africa legal journalist Karyn Maughan said on the weekly television show Justice Report, anchored by Justice Malala. According to South Africa's City Press, the case against Carl Pistorius was initially dropped and then reinstated under pressure from the victim's family who felt the circumstances surrounding the accident constituted negligent or reckless driving. After the reinstatement, trial was set to begin Thursday, the day before Oscar was granted bail, but was postponed to next week. All this dropping and reinstating of cases seems bizarre, but it is apparently a regular procedural feature in South Africa. To drop and then reinstate charges is "not uncommon in South African criminal law. The law specifically makes provision to allow charges to be dropped and then to be reinstated as a result of further investigations," said Jacob van Garderen, director of Lawyers for Human Rights. "It is a practical procedure, a process that is there to assist both sides." There is presumably a statute of limitations-like bar to this procedure's applicability, otherwise it's not clear how it's ever beneficial to the accused. Carl will be represented by the same attorney representing his brother, Kenneth Oldwage.